Yeshivot Bnei Akiva News: AFYBA Hosts Book Launch for Tuvia Tenenbom' "Catch the Jew!" 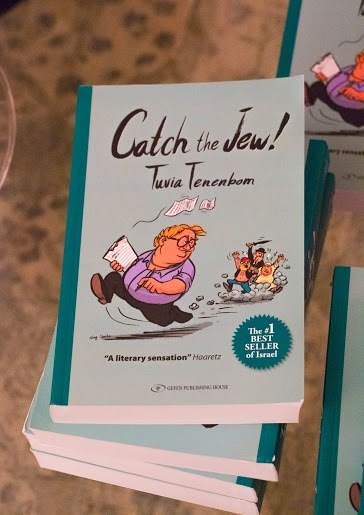 AFYBA Hosts Book Launch for Tuvia Tenenbom' "Catch the Jew!" The Book Launch Party on Feb. 23rd hosted by American Friends of Yeshivot Bnei Akiva (AFYBA) for Best-selling Israeli author Tuvia Tenenbom’s “Catch the Jew” brought out 60 people on a bitter cold night in NYC. Among the guests were Congressional candidate from the 12th district Nick Di’Iorio, Media Consultant Shira Dicker, Wall Street Journal reporter Gregory Zuckerman and The Times of Israel’s Simone Dinah Hartmann. Alan Wildes, past President of AFYBA and YBA Hakotel Alumnus, took the floor with an introduction of Yeshivot Bnei Akiva and the accomplishments of the network, dropping big names of outstanding alumni while highlighting the strong presence of the YBA network in Israel. Ken Abramowitz, Advisory Committee member for AFYBA and President of American Friends of Likud, spoke about the threats against Europe today in his pitch to “save the west” which he writes about on his SavetheWest blog. Before Tuvia took the floor, Allan Leicht, a playwright and AFYBA Board Member, did a beautiful job reading a chapter from Catch the Jew that described Itamar, Jewish tour guide that Tuvia met at Yad Vashem, who compared the IDF to the Nazi regime. Everyone in the room was speechless. There were many questions from the audience and lively discussion as Tuvia expertly fielded comments. Security Assessment Chief of One Israel Fund, Marc Provisor from Shilo jumped in as well to explain the facts on the ground. "There is a serious game being played in Israel and American Jewry needs to wake up."